Or maybe he would already be green from all that spinach that he ate. Spinach is such a wonderful super food but it seems to get a bad rap. While I don't think that spinach in a can is super delicious, adding fresh spinach to dishes can add some variety. (In manicotti, dips, salads, etc.) But I am not writing this post to try and get you to enjoy the flavor of spinach. No on the contrary this is about how you can eat your spinach and not taste it. How might you ask? Well put it in a smoothie, that's how! I know that the thought of drinking spinach might sound unappetizing but you can't taste the spinach at all. All you taste is a nutty sweet milkshake flavor, but you still get all the nutrition of the spinach. So you get to eat your veggies and not taste them too! 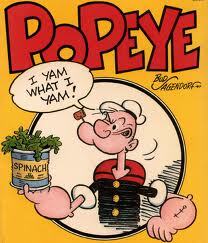 That would make even Popeye a little jealous. Optional: Throw in 1/2 cup of blueberries or cherries into the blender for some added sweetness. If you are eating this as a source for a quick breakfast on the go, try throwing in a scoop of protein powder to beef it up. This recipe isn't very set in stone so just play around with it! I place the banana, yogurt almond butter and almond milk in the blender and then fill it up to the top with spinach. Blend until smooth and enjoy! ***Note: If using plain yogurt and no fruit, you might be lacking some sweetness so I suggest adding in a few teaspoons of honey. ***Note: I like almond milk and soy milk over cow's milk because cow's milk lacks the depth of flavor that i enjoy from the other two milks.